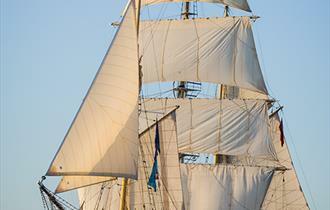 Treat yourself to some time at sea sailing our classic gaff rigged cutter, Tallship Moonfleet! Here’s a real opportunity for both novice and sailor to try your hand at classic tall-ship sailing around Southern England’s stunning Jurassic coastline and the fascinating chalk downlands of The Isle of Purbeck and The Isle of Portland. If you prefer to just come along for the ride, then feel free to relax and take in the sights and sounds of sailing the coastline. The sailing introduction is all based around a ‘toe in the water’ experience, where you can learn the skills and activities needed to take a tall-ship to sea and see how to harness the power of the wind. For those keen to have a go, our crew will provide training in most activities that can be fitted into the short voyage, from weighing anchor to hoisting the mainsail - even taking the helm! Moonfleet is an International Yacht Training Sailing School, so not only will you have an unforgettable sailing experience, you may ask our crew about how you can enjoy further training and benefit from formal qualifications. We don’t provide catering however, if it gets chilly, we’ll break out the biscuit barrel and put the kettle on the stove. Tea and coffee for the crew – that means you! You’re welcome to bring drinks and snacks if you feel like taking a picnic at sea! Also, regardless of the weather forecast, bring something warm and dry to wear. We’re not sailing into rough waters, but we are putting to sea! Our planned trips are posted on our website and facebook page however, trips are weather dependant so check online for our next day's sailing plans, or call the booking line, or come down to Portland Marina and see what we’re doing!